South Sudan’s second largest city, Malakal, held a peace celebration in scenes reminiscent of the atmosphere when the young country became a republic seven years ago. The celebration was a culmination of a series of engagements between uniformed and civilian leaders from across the divide. The political engagements facilitated by UNMISS, the UN Mission in South Sudan’s office for Upper Nile, have seen leaders visit each other’s territories freely to demonstrate that peace has indeed been attained. "Salva Kiir and Riek Machar have done their part. It's time for all of us to do ours," said Major General James Mawich Makuach, the Director General for Administration and Finance from the Sudan People’s Liberation Army-in Opposition (SPLA-iO) Mobile General Headquarters in Diel. "Yes, yes to peace! No, no to war!" came the resounding calls in unison in response to his prompts from the podium. Nearly three thousand people withstood the heat for hours, listening and cheering, as leader after leader stood up to speak at the Malakal stadium. The leaders spoke positively, embraced and held hands while joining the crowds in song and dance. Several national cabinet ministers from the capital led by Information Minister Michael Makuei, were part of the celebration. “It’s time for us to stop looking at those in opposition as enemies and instead look at them as brothers,” said Mr. Makuei. He encouraged the state government and the people to work collectively for peace and reconstruction so that Malakal can return to its former glory. In an unprecedented series of events, military and civilian leaders in South Sudan’s Upper Nile region have begun engaging in confidence-building trips into areas previously solely occupied by either government or opposition forces. UNMISS Acting Head of Field Office Mike Dzakuma told those present at the peace celebration that the signing of the revitalized peace agreement was just the beginning of the process and pledged continued support in the days to come. The mission’s field office also facilitated a community meeting, where people living in the protection site interacted with local government authorities and a visiting opposition delegation. Prior to this, internally displaced persons living in the camp have been averse to visits from those in authority. 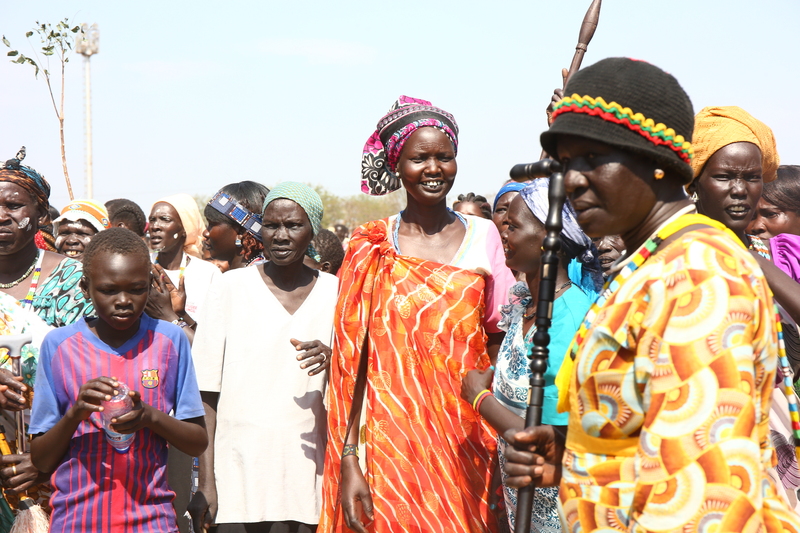 Josephine Orach who spoke on behalf of internally displaced women welcomed the leaders from both sides and reminded them to set aside their tribal differences. UNMISS has urged the parties to maintain the good will and called on everyone to spread the messages of peace from both sides. Beyond the calls for peace, leaders have also had open discussions with resolutions allowing free movement of civilians. The delegations are also openly condemning hate speech and tribalism, while pledging a complete and immediate cessation of hostilities.